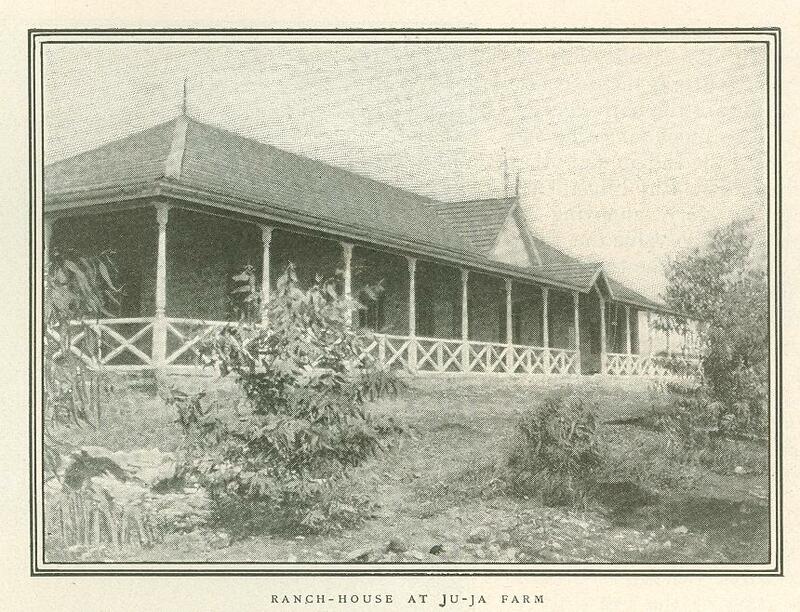 J u- J ah House is one story high and of great ex­tent, surrounded on all sides by a veranda. Hall­ways running across the house from every side give entrance to the rooms, which open through French windows upon the veranda. At the northwest corner, looking out upon the plains and the mountains is a kiosk where midday refreshment and afternoon tea are served. Each guest has his own Somali servant who responds to his call and attends to his needs. Conveniences abound which might well make one forget that he is next door to the wilderness. There is a telephone service connecting the house with every part of the farm. Electric lights are furnished from a power plant operated by turbine on the river, and there are storage batteries for a resource in case the dynamo "goes dead." An artificial ice plant cools the atmosphere of the house and supplies plenty of ice for beverages. Pianos, talking machines, and the magazines are at hand. Open house hospitality is the custom of a new country. At Ju-Ja hunting parties help themselves, if they arrive in the absence of the master. The house is like a hotel on the road to the great northern game fields, and the great sportsmen of the world are pretty sure to drift in their sooner or later. The temperature at this altitude of fifty-­four hundred feet is agreeable throughout the year. Torrential rains for six weeks in the spring leave the air damp, but at other seasons the heat is dry like that of Colorado, though not so wearing on the nerves. White men wear a pith helmet and covering for the neck as a protection against the sun. The native carriers go bare-headed and smear their skin with a preparation of red earth and castor oil. The gardens at Ju-J a are wonderful. Acres of them cover the hillsides that drop away to the river boundaries of the farm. Flowers that in this country blossom at different seasons bloom all together in the violet sunshine. The pansy, a spring flower in temperate climes, grows beside the fall chrysanthemum. Peas, potatoes, lettuce, and beets mature week after week the whole year round, according to the time of planting. The government is deeply interested in McMillan's experiments in the domestication of native animals. No other individual is so well equipped to attempt the work on a scale that will yield immediate results. When he first bought Ju-Ja, McMillan intended to raise ostriches, but the colonial government has since then prohibited the capture of the ostrich for breeding. The result of this restriction, which is severely criticized by the settlers, is that the birds lay their eggs anywhere on the open veldt, where they are eagerly sought by other game. This is the reason given by the settlers for the failure of the ostrich to multiply, as against the claim of the colonial office that confine­ment threatens them with extinction. The birds run wild, but when rounded up, driven into the corral, fed, and then liberated, they return for food and become easily domesti­cated. McMillan's most important experiment in breeding is the removal of the hump from the native cattle by interbreeding them with Durham bulls imported from England. The second generation of calves show a perceptibly decreased hump, besides a noticeable improvement in the quality of the meat, which of course is the objective point. The meat of the native beeves is stringy and too tough for eating and for shipment to the Indian and other South African ports. But "McMillan's experiment" is very annoying to British epicures, who value the fatty hump as a delicacy for the table. Pigs are being imported by this enterpris­ing American, and the breeding of swine under the equator has a very promising outlook. The mule is another factor in breeding, since its importation from the United States during the Boer War. McMillan's success with the mule is making an industry. The whites in the Nairobi district keep a great many fine horses; but horses are restricted to the high lands, away from the river bottoms, where the sting of the tsetse fly is fatal. McMillan does very little hunting now, and that only when organizing hunting parties for the entertainment of his guests, as he is now doing for Mr. Roosevelt. Mrs. McMillan, who also has killed her lion, comes with Mr. McMillan from India, to spend two months at the farm, including the period of Mr. Roosevelt's visit. His coming has been talked about for the past year at Nairobi, indicating the length of the correspondence between him and Mr. McMillan before the hunting plan was made public. McMillan will meet the Roosevelt party at Mombasa and ride two hundred miles up the Uganda Railway to Muchakos, where the ex­-President will leave the railway and travel twenty miles to pay a fortnight's visit to Sir Alfred Pease, an old friend who has hunted with him in America. 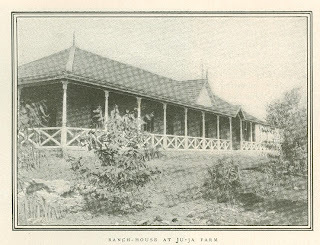 Lieutenant Colonel James Hayes Sadler, Governor of British East Africa, and Lieutenant Governor Jackson, who is in charge of the Hunting Department, will meet Mr. Roosevelt at the Pease Farm. There Mr. Roosevelt will be formally notified that the government confers upon him an unlimited privilege to shoot within its African jurisdiction. Mr. Roosevelt will then move to Ju-Ja Farm. For a distance of one mile on either side the tracks along the line of the railway all game is protected. Winston Churchill, who was in British East Africa last spring, rode on the pilot of the engine to observe the game. The rail­way leads through a zoological paradise. Churchill saw six lions from the train. Mr. Prynne, from whom the facts used in this article were obtained, saw four on the same journey. A male and female, pacing side by side, were not three hundred yards from the passengers. The pair merely turned their heads to look at the train. At another point in the panorama he saw a female lion stretching like a cat on the red veldt near the train, and again a male on its haunches in bold relief on an ant-hill. Bands of antelope of all species, the kongoni, water buck, reed buck, wildebeeste, hartebeeste, impala, orax, and countless others, together with thousands of zebras passed in review. Ostriches and hyenas were common sights from the car window. All these animals seem to know that they are immune from danger in this protected belt. Outside this narrow zone animal traits have changed with the ap­pearance of the white man. Some of the more timid have retreated entirely. The bolder game give little heed to the natives, who they know have no guns, but they flee before a white man on foot or mounted. A buckboard is not avoided as long as it is moving. They have learned that the gun cannot be aimed with accuracy from a jolting vehicle on an African road. The instant the buckboard stops, however, every beast within range will scamper for cover. If the hunter can drop from the rear of the moving buck­board, he may get a quick shot. The elements of danger in African hunting are a revelation to an American sportsman. African game is placed in this ratio of risk: 1-buffalo; 2-rhinoceros; 3-­lion. The buffalo is feared because, as the hunter asserts, the beast "does not play the game fairly." It is considered the most vicious and cunning of all African game. It attacks without provocation, seeming to take malicious satisfaction in killing man. When wounded or even angered, its ruse is to lure its enemy into the bush, which grows higher than a man's head, by pretending flight. Then the animal doubles upon its track and makes its sudden attack from ambush as the unsuspecting hunter advances on the forward trail. To checkmate this trickery, the white hunter sends his shikaris into the treetops. The natives from their ele­vation trace the deceptive course of the buffalo by watching the bending of the bush, and report from time to time the position of the beast, so that the hunter is prepared when the animal breaks cover. The charge of the buffalo is like a thunderbolt, and a lunge from its horns is nearly always fatal, even if the hunter is rescued before being trampled to death. The deception practised by the buffalo is attributed to an instinct which tells the animal that it is quite vulnerable to a bullet. 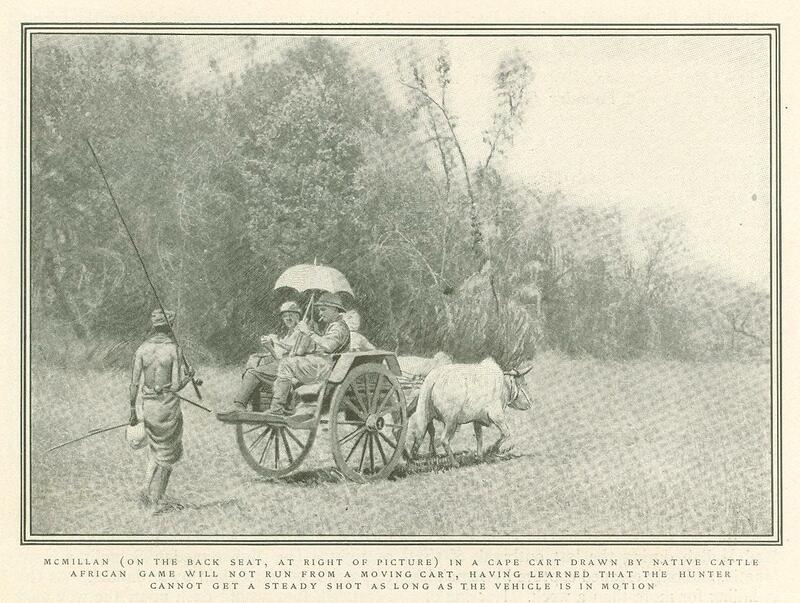 Slaying of the buffalo in British East Africa so nearly became slaughter that now each hunter is allowed to kill but two. In Uganda, where the beast has multiplied rapidly, the number permitted is ten. The rhinoceros is dreaded because no hunter knows when and where he will find the animal. Its habit of secluding itself in unsuspected haunts makes it the nightmare of the hunter. The hunt may be for lions or antelope, when at the wrong moment the "rhino" will appear. Then there is a general scattering. The beast scents for a great distance. Not able to see beyond a few feet, its attack is guided by its sense of smell and aided by remarkably acute hearing. Once started, the "rhino" charges in a straight line without deflecting an inch. Armor plated like a battleship, this horned ram charges with the force of a catapult. Nothing withstands the furious storm of its onset. Thorn trees topple in the path of the beast, brush is mown down like wheat. No shot can penetrate the armored front unless a chance bullet from a side angle enters the brain through the eye. Caught near the edge of its rush, the native hunters sometimes stand transfixed, hoping that the beast will take them for a tree or bush and merely graze them. A bullet behind the fore leg is the only safe shot to stop the whirlwind ram­page of this tremendous beast. There is a distinction in Africa between ordinary lions and "man-eaters." The ordinary lion does not willfully attack man. The presence of lions roaming at night on the veldt is not disturbing to any native nor to whites who have come to understand the beast. Persons returning to their camps after nightfall do not notice the roaring of lions, or the cries of leopards and hyenas. It is seldom that people bent upon domestic errands carry weapons in the darkness, although at night the veldt of British East Africa is alive with roaming beasts, which may be heard from the verandas of the houses. Lions give the passing man a wide berth, day or night, when it is apparent that he means no mischief. An ordinary lion, even when wounded, will try flight before fight. When its escape is disputed, it will, especially if wounded, try to maul its enemy with teeth and claws. A lion hunt is usually a chase in which the hunters goad the game into combat. Once a lion has tasted human blood, however, it is no more afraid of man, but learns that he is the weakest of animals and the choicest of meat. Such a lion is known as a man-eater because now he hunts man. Between six and seven hundred native workmen were sacrificed to man-eaters during the building of the Uganda Railway from Mombasa, on the coast, to Port Florence, on the shores of Victoria Nyanza, five hundred and eighty-six miles inland. Thirty natives were eaten in one place. Colonel Patterson, a British engineer, has written the best account of these ferocious beasts in "Man-Eaters of Tsavo," a narrative of the construction of this railway. On the outskirts of Nairobi, a man­-eater stole into a native house just before sun­set. Entering a room, he seized a man who was lying on a bed. The window sashes had been closed, but the man-eater came through the door. Another native, outside the room, saw the lion enter and, supposing that the room was empty, closed the door to capture the. beast. With the screaming prey in its mouth, the caged lion, undaunted, crashed through the closed window, and the man's brains on the casement showed with what force the animal had torn its way to freedom with its quarry. The hippopotamus, or "hippo," as it is known, although of the big game order, is a timid animal and not easily found by the hunter, as it was one of the first to retreat before the advance of the white man. It has taken to remote places in lakes and rivers not usually sought by the hunter. There the lumbering river-horse bur­rows under the muddy banks, where it lies con­cealed, or walks along the bed of the waters, rising at intervals to fill its lungs with air and then slowly sink. When it's great back is seen emerging before any other part of the body, the hunter is apt to mistake it for a huge turtle. Then slowly the ugly ears appear, and last the bare center of the broad forehead. A well­ directed shot at the center of the forehead kills the animal, which sinks, but finally rises to the surface. In spite of his timidity, the "hippo" is no mean antagonist when his path to the river is disputed, a thing that sometimes hap­pens when the beast strays from his haunt. At close quarters the mammoth teeth are used with fatal effect. Attacked in the water, the "hippo" has the advantage, and will crush boat and men. An associate of McMillan killed a "hippo" last year, after a narrow escape, when he and his wife had unexpectedly met the beast returning through the brush to the river bank. That night a "hippo" wandered into the camp and awoke the sleepers. The natives said it was probably the mate of the dead animal. Elephant hunting is little more than slaugh­ter. Although the beast will fight when at­tacked, modern arms generally insure the hunter's killing the game without any such danger as attends the hunting of the buffalo and the rhinoceros. It is the exceeding big­ness of the game in this instance that attracts the hunter. The heavy importation of ivory tusks attests the wholesale success attending elephant slaughter. The wild dogs of Africa are more feared by the natives than any other beasts, for while they are not to be dignified by the term of game, they run in packs and seem to know that the native is afraid of them. Native burden ­bearers will often take their chances in passing around a buffalo herd and will hardly notice a lion, but when they hear the howl of the wild dogs they drop whatever they may be balancing on their heads and take to the trees. There they are frequently held captive until their cries summon assistance. Crossing the trail of large game, these dogs often interfere with the pursuit. At a distance the hunter is likely to mistake them for leopards or some of the smaller game. Intense disgust follows the wounding of a wild dog, for then, according to the ethics of the chase, the true sportsman must pursue and kill the beast. These dogs are not degenerates, but are natural mongrels. They have low bodies covered with hair of coach-dog growth, bushy tails, and powerful jaws. Many are the stories of the safari (hunt) that are told at ]u-]a. Only two years ago two bosom friends who were hunting lions separated better to beat the game. The lion surprised one of the hunters and tore his body until it hung together by the sinews. When his friend found him, he saw that he was past all surgery. But the man's mind was alive, and he begged his comrade to end his sufferings. That friend found the courage to place his pistol to the sufferer's head and fire the shot that gave him release. Tales of the safari have their humor. An English hunter, disappointed in failing to find his first lion and hearing the cry simba (lion) rushed from his tent, in his pajamas, to meet the "King of Beasts." He shot the lion like a true native - naked in the jungle. They tell another tale of an English woman and her man servant who were chased up a thorn tree by a herd of buffalo and kept there thirty-six hours before relief came. The lady was having thorns of different sizes and varying irritability ex­tracted for a week following the adventure. Then there is the old story of Major Ringer's horse (Mr. McMillan bought Long Ju-Ja of that gentleman, and the incident happened there during the Major's residence). It is no unusual thing for lions to sit in a row outside one's door by night and roar. The Africander thinks no more of this than he would of barking dogs, unless he cannot sleep for the noise, when he goes to the edge of the yard and shoos them away. Major Ringer's favorite horse had a habit of poking his nose out of the high open window above his stall. One night an inquisitive lion crawled up to the window and sat licking his chops beneath it, when he saw the nose getting its airing. Rising on his hind legs, the lion made a "swipe" at the nose with his big fore paw. The sharp claws raked the horse's face from the eyes down to the sensitive nostrils, drawing blood and send­ ing the horse into hysterics, not so much from the pain as the sudden whiff he got of lion odor. The screams of the horse put the lion to startled flight and awakened the Major. Nothing would induce the horse again to enter the stable after night-fall, the Major in­stalled the horse in the house and went to sleep himself in the stable, This was the state of things at Long Ju-J a when McMillan took possession and renovated the premises. The story of the Major and his hysterical horse has gone up and down the land. 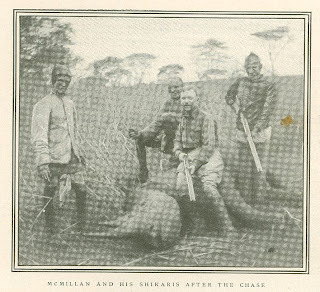 McMillan's own experience in slaying his first lion was dramatic. He came face to face with a superb beast before either lion or man was aware of the other's presence. The lion was standing fifty paces from the hunter. It launched upon him with open jaws. There was not time to bring the weapon to his shoulder, so he shot from the hip. The bullet entered the mouth and lodged beneath the tongue. The effect of the shot was to stagger the beast and shorten the spring, bringing the animal down sharply to its feet. Reaching for his second gun without taking his eyes from the lion, McMillan shot as the lion sprang at him. The second bullet grazed the inner side of the fore shoulder bone and angled into the heart. The beast dropped dead at his feet. Another time McMillan had seated himself on a stump, to rest. Dense bush shut him in. His gun was propped against a tree a few feet from his seat. All at once he turned uneasily and gazed into the eyes of a lion crouched slightly behind him and to his left. Neither lion nor man stirred from the entrancement until the near cries of the shikaris caused the lion to shake off the charm and, with a tremor of its big muscles, wheel into the brush. Passion for adventure, and almost unlimited wealth, have enabled McMillan to become a factor in the game many nations are playing on the world's last frontier. In this sense he is the most important American in Africa. From Mombasa on the east coast to the coffee houses at Cairo the unwritten exploits of "the Ameri­can millionaire" are heard in scraps of con­versation. Whether breeding the "hump" off native cattle and destroying an African table delicacy to furnish the shipping market with a whole beef, killing scores of wild beasts as splendid peace offerings to savage kings, or fitting out large expeditions at his own expense, McMillan does things on a scale that makes talk in Africa. Unofficial services to civilization, like his ex­ploration of the Blue Nile in 1902 under the powerful sanction of Menelik of Abyssinia, and the penetration, during 1904, of British East Africa's "wild strip" in the interest of the Cape­-to-Cairo railway, have earned McMillan the confidence of the British government and the respect of the tribesmen who know him as Boma Macoubah - Great Master. As a magis­trate of the protectorate, McMillan holds power of life and death at his strategic farm, which in fact is a slumbering fortress with a garrison of seven to eight hundred brave Somalis. 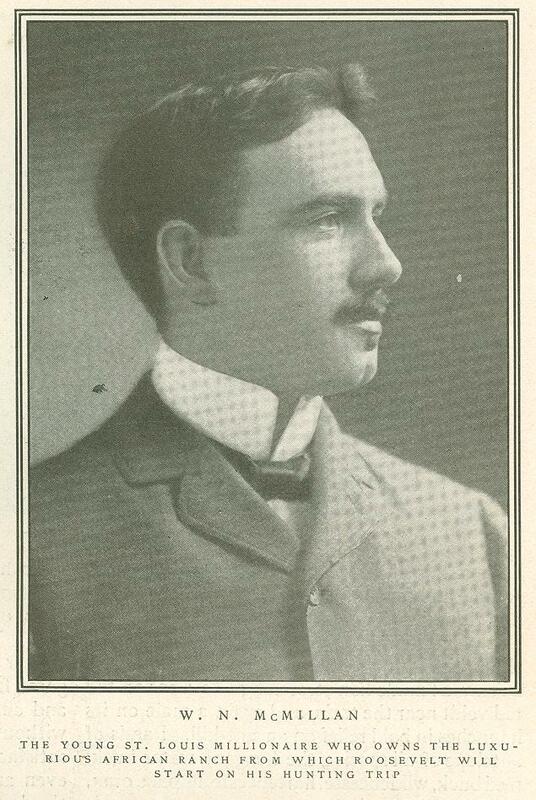 McMillan is the nephew of the late United States Senator McMillan of Michigan. He is the son of the late William McMillan whose great estate holds the controlling interest in the American Car and Foundry Company of St. Louis and other investments that have largely increased a fortune of many millions. A daughter of Senator McMillan is Lady Harring­ton, the wife of Sir John Harrington, British representative at the court of King Menelik. Like Roosevelt, young McMillan had his first experience with big game in the American West. Shooting from the hip at close range he learned in New Mexico, when as a fragile boy he was sent there to rough it on his father's ranch. He won health and hardihood hunting in the Rockies. McMillan is thirty-six years of age, six feet and three inches tall, and when in hunt­ing trim, weighs two hundred and fifty pounds. Africa beckoned McMillan ten years ago while he was in Algiers. Learning of the op­portunities for big sport in British Somaliland, he sailed down the Red Sea to the Gulf of Aden. At Berbera he equipped his hunting party of natives and soon found himself in the Singali Mountains among the antelope. In pursuit of lions the party wandered into the country of the Mad Mullah during the last outbreak of that fanatic, and only escaped capture by remaining in hiding for more than a week. Hearing of a rare species of antelope in Abyssinia, McMillan sailed up the coast to a landing. Although warned of perils in the interior from hostile natives, he marched straight to Menelik's capi­tal, hunting on the way and winning the friend­ship of the natives by killing game for them. Menelik was pleased with the boldness and good nature of the young man. The monarch made. him promise to return, after giving him permission to explore the Blue Nile into Abyssinian territory. McMillan returned to Cairo by way of Suez. 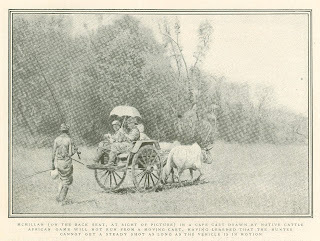 The expedition for the Blue Nile was fitted out at Cairo. Mrs. McMillan accompanied the expedition as far as the steamer got above Khartoum. She climbed the great cliffs lead­ing from the Nile Valley to the vast tableland of Abyssinia, parted with the explorer, and descended the river to Khartoum to await him. Up to the point where the boats were brought into service, the river flowed broadly through heavy growth. As the string of boats entered a gorge, however, the stream contracted until, two hundred miles above Khartoum, the boats were broken in a series of rapids. The party retraced their route on foot, beset by every sort of hardship. None of them ex­cept McMillan were armed with guns. He killed all the game on which the Somalis sub­sisted. In shooting he was compelled to exer­cise rare sportsmanship to avoid killing the quarry, generally antelope and hippopotami­ outright. The Mohammedan Somalis refused to partake of meat slain by an infidel. As the beast fell, they would dash upon the wounded game, and "Allah" the prey - that is, slit the throat and mumble the Mohammedan prayer as the blood flowed. It was while engaged in this exploration that the French heard of McMillan and began diplomatic inquiries about his business. The feeling in France at the time was still so intense over the Marchand disaster at Fashoda, that McMillan's presence, then, on the Abyssinian waters of the Blue Nile, was re­garded as a breach of the entente cordiale. The British embassy gave satisfactory assurances that the expedition was the private venture of a wealthy American. The effect of the exploration was to disabuse the British mind of attempt­ing to divert the commerce of Abyssinia inland by way of the river to Cairo, thus wresting a great trade from the French protectorate on the coast. McMillan found that the river in Abyssinia was not navigable. Four years ago, when McMillan entered the "wild strip," accompanied only by his Somalis, it was without firing a shot against a savage in a region from which numerous expeditions had been turned back with records of resistance and massacre. All his friends had tried to dissuade him from an experiment in which several power­ful expeditions had failed. But he was firm in his purpose to solve the enigma of the strip lying directly north of Uganda and forming the shortest route for the "Cape-to-Cairo" railway between all the British possessions in South Africa and those in the Soudan. A British expedition had been turned back into Uganda by the hostiles of savage tribes. An Italian expedition had been massacred by the natives only a few years before McMillan started up the Nile from Cairo. Passing Fashoda where Marchand met his fate, the American entered the Sobat River at its mouth and floated into the territory. He traversed the entire strip, encountering a tribe of gigantic blacks, and returned through the same region after penetrating Masailand, now a part of British East Africa, and hunting around Lake Rudolph. With his usual good nature placated the savages by shooting scores of lions, buffalo, and antelope as presents for the native chief. He learned from one of the most northerly tribes that the commander of the ill-fated Italian expedition had been taken a prisoner into this tribe, but was tracked there and murdered by natives of a southern tribe whose chief had been mistreated by the expedi­tion. McMillan found the country an easy one for the railway to penetrate, but filled with volcanic drift, making it unprofitable for agri­culture. His expedition opened the "wild strip" and proved its adaptability for construct­ing the last link in Cecil Rhodes dream of Cape­-to-Cairo supremacy. Originally published in McClure's Magazine. March 1909.